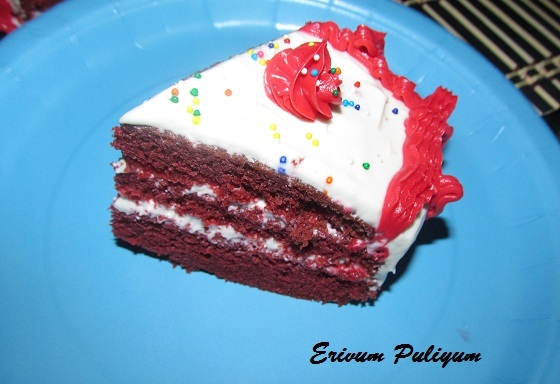 Erivum Puliyum: Red Velvet Cake with Red Roses & Happy New Year !! Red Velvet Cake with Red Roses & Happy New Year !! -Sift the flour ,salt,cocoa powder and baking soda. -In a blender,Beat the butter until soft .Add in the sugar and beat until fluffy for 2 minutes.Add the eggs one at a time and beat well.Add in the vanilla extract and mix well. 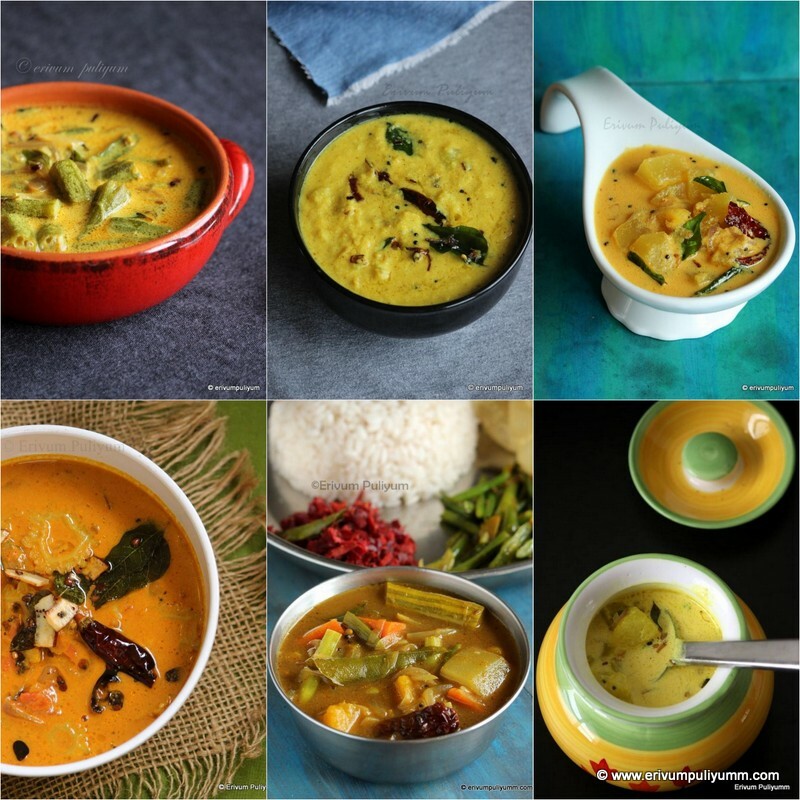 -Add the food colour to the buttermilk and mix well.Alternate the flour to the wet ingredients and mix smoothly. -Pre heat oven to 350 degrees C and pour the batter into the prepared pan ,place the pan in the oven. -Bake for 35 minutes and cool on wire rack till 10 minutes. 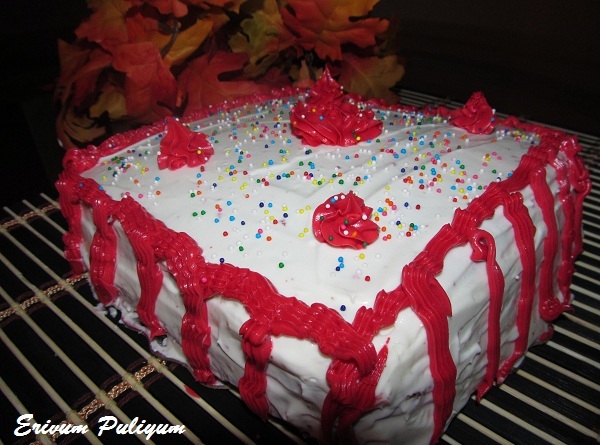 -Invert the cake and lift the pan.Wrap the cake in plastic wrap and Cool in refrigerator for 1hour. -Cut the cake in three equal layers and place on a parchment paper. 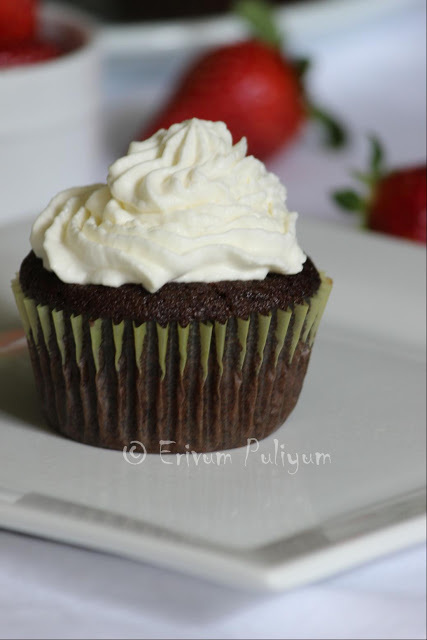 -In the mean time,prepare the cream cheese frosting.Beat the cream cheese at room temperature until smooth and add the powdered sugar to it.Add the vanilla essence.Add the whipping cream to it and make it thick enough to spread. -Place the first smoothly cut layer on the plate or cake stand and then spread the layer of frosting. -Similarly do the other layers stacking till you reach the top with other layers.Spread with a offset spatula and smoothen the top. -Make red roses using the bottled icing and add sprinklers OR garnish as per your creativity. *Be careful while you add the red colour seeing not to stain the table and other surfaces. *While applying frosting,take forward strokes and preferably don't take the back strokes. Colorful n yummy looking cake.. Belated new year wishes. What a great looking special cake; has been on my Must Try List. 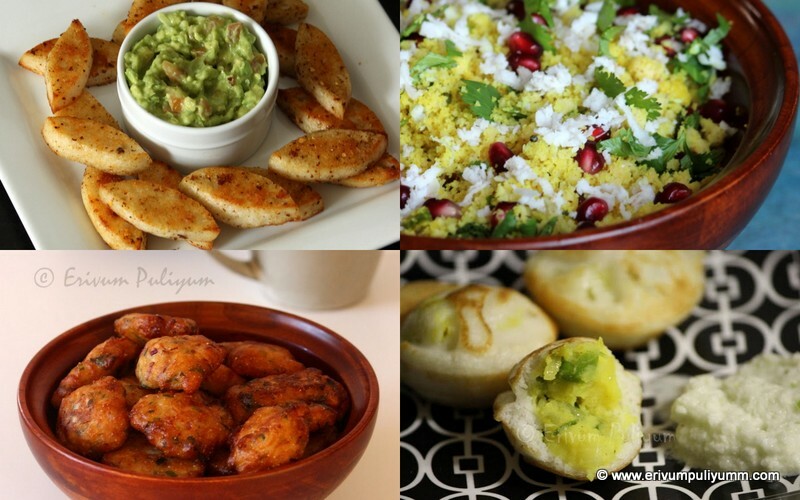 Your recipe is a keeper; thanks. Happy New Year Julie! New special recipe was superb, Red Velvet cake looks so perfect n delicious.loved your decoration too...U have done a great job !! cake looks awesome, perfectly baked..frosting looks nice..great job Julie..
Thats such a beautiful looking cake! A sweet way to start the new year. 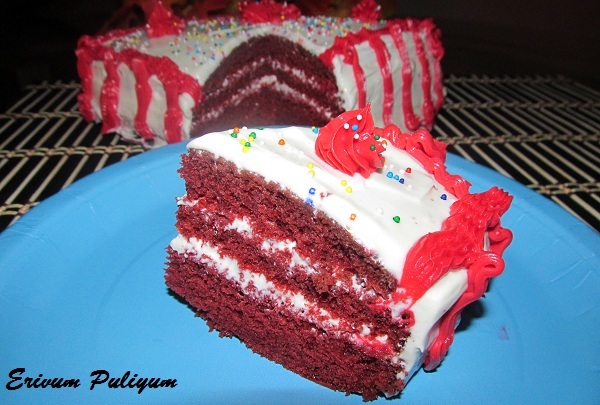 Once again a wonderful baking recipe from you Julie,..thanks for posting. wow... cake looks so good... delicious.. Wow!! !cake looks so moist and delicious....drooling here. RV Cakes are our favorite, this luks fabulous. I made it once way back, haven't posted though.. Once again wishes for a great 2012!!!!! wow ...dats a beauty!! !lovely cake !! Happy New year Julie. cake looks yum.. colourful frosting ideas! Wow wat a beautiful cake,looks awesome and damn gorgeous. Awesome cake dear and thanks for visting my blog. Happy New year to you and yours Julie...yummy cake..perfect to welcome the new year. WOW....WAT A WONDERFUL CAKE..ITS AMAZING..DECORATION OF THE CAKE IS SIMPLY SUPERB..ITS MOUTH WATERING. What a coincidence, you also baked a same cake huh, hehehe . Happy New Year to you. nice colorful cake !! perfectly made !! wishing you & your family a very happy new year..
hi julie, very striking red and a beautiful name for your new year cake. a slice for me please..got your email, will revert to you ok. have a nice day. You have a lovely space...glad to follow you too !!! Gorgeous and lovely cake, wish you a very Happy New Year ! You have with lot patience and came out extremely good!! 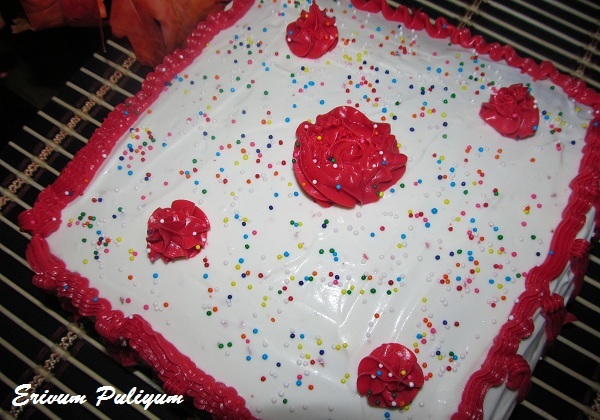 Hi Julie, thanks for visiting my blog and now I'm visiting yours :)..a great cake to greet the new year..I love red velvet. I wish you a very Happy New Year. Lovely, a sweet way to start off a great year. :) Happy New Year Julie. ohh Lovely cake Julie ! So tempting. Can i have one piece?? ;) Happy New Year to you!!! Cake looks so delicious & beautiful...Wish you a Happy New Year!! Hi, I hop over from Sonia's blog and what a co-incidence, I too posted a red velvet cupcake for the New Year. Perfect..Nice decor..Red color 2 tbsp or tsp,Juls? @ deep :Its 2 tbsp dear and thats because we got to have a deep red colour to the cake.. 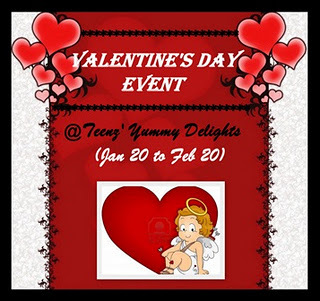 So glad to receive this yummilicious recipe for my event!! Love this cake & decoration.Love to follow ur blog. Trifle Pudding & Awards !!!! !